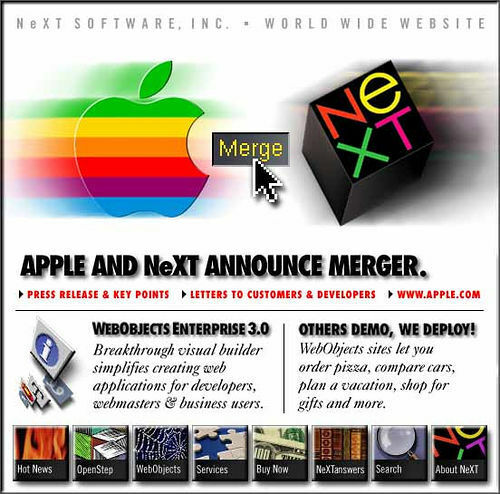 Apple Computer, Inc. today announced its intention to purchase NeXT Software Inc., in a friendly acquisition for $400 million. Pending regulatory approvals, all NeXT products, services, and technology research will become part of Apple Computer, Inc. As part of the agreement, Steve Jobs, Chairman and CEO of NeXT Software, will return to Apple — the company he co-founded in 1976 — reporting to Dr. Gilbert F. Amelio, Apple’s Chairman and CEO. The acquisition will bring together Apple’s and NeXT’s innovative and complementary technology portfolios and significantly strengthens Apple’s position as a company advancing industry standards. Apple’s leadership in ease-of-use and multimedia solutions will be married to NeXT’s strengths in development software and operating environments for both the enterprise and Internet markets. NeXT’s object oriented software development products will contribute to Apple’s goal of creating a differentiated and profitable software business, with a wide range of products for enterprise, business, education, and home markets. I’d argue that this is probably the single most important tech acquisition of all time. What came out of this deal not only saved Apple and the Mac, but made the iPhone, iPad and more possible as well.